A weight tracker is a valuable weight management tool. Keeping an ongoing weight log will help you identify weight trends. 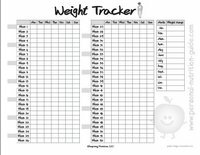 Download and print one copy of the free tracker. Make a decision about how often you plan to weigh**. Weigh yourself and record on the weight tracker form. Weigh at the same time each day, preferably in the morning. At the end of each month, review all recorded weights and make a note of your weight range over the entire month. Take notice of your weight trends over time. Print a weight log every year. Create a special file labeled "weight log tracker" to keep track of your forms year to year. Note your weight trends over time. ** There's room on the tracker form to record weight daily. However, if logging weight weekly is more desirable, designate one day of the week as your "official" weigh in day and stick to it.